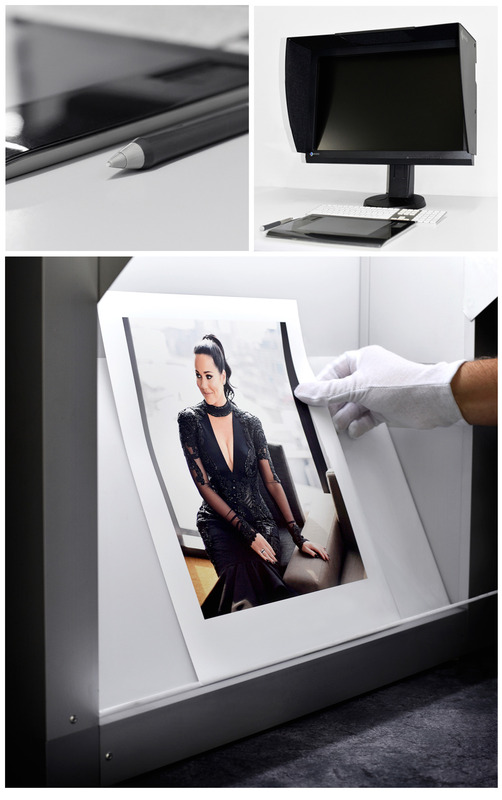 We use and recommend Eizo Screens, which can be calibrated and profiled accurately. Laptop screens are not recommended for critical colour judgment because of the differences observed in the image at different viewing angles. Please remember that a computer screen will not exactly match a photograph because of the different methods of generating the colours that are viewed. Computer screens emit light, where as the dyes in photographs absorb light and the paper base reflects light which is not absorbed. Consequently, it is important to view photographs under standard lighting conditions when trying to assess whether the colours match your expectations. Calibrating your monitor to international standards provides 100% certainty that you are viewing your images correctly and therefore any adjustments you make will be accurate. The only way to calibrate a monitor correctly is to use a hardware device that is compliant with ICC standards. After calibrating your monitor you can be confident that the files dispatched to us and your clients are exactly as they should be. Colour management eliminates guesswork and trial and error and ensured optimal production efficiency. We advise you to preview images prior to printing with us to minimize screen and print discrepancies in both RGB and CMYK. We can also print test strips on your desired paper surface before printing quantities or large print outputs. Refer to the File specs drop down menu for further information on set up on this website. Here are Prism, we strive to give every customer top-quality products and service, which is why we’re happy to offer advice and assistance. Don’t hesitate to call us on 03 9326 6635 or visit us in-store.